The growing of aroma hops has a thousand-year tradition in the Czech Republic. The marking of hop which included labeling and verifying of hop origin has already begun in 16th century. The first state regulations dates back to 18th century when the Empress Maria Theresa issued an act against hop falsification – the patent about official sealing of hops and issuing documents which guaranteed unique origin of hops - in year 1769. The Regulation No. 2081/92 from 14th July on the Protection of Geographical Indications and Designations of Origin for agricultural products and foodstuffs regulates two particular groups of protected geographical names: designations of origin and geographical indications. - and the quality or characteristics of which are essentially or exclusively due to a particular geographical environment with its inherent natural and human factors, and the production, processing and preparation of which take place in the defined geographical area. The European Union provides via Regulation No. 2081/92 the protection of designation of origin and geographical indication of selected regional agricultural products whose reputation extends beyond national borders and helps the promotion of these products. On the base of Regulation No. 503/2007 from 8th May 2007 the designation ZATECKY CHMEL (PDO) was registered in the List of Protected Designations of Origin and Protected Geographical Designations. In the European Union this is the first given designation for hops and one of the first designations given to Czech agricultural or food products. The mark ZATECKY CHMEL can only be used for fine aroma hops of Saaz variety (all its registered clones) grown in Zatec (Saaz) hop growing region. As ZATECKY CHMEL (SAAZ HOPS) can be designated only these clones of the Saaz variety: Lucan (registration in 1941), Blato (1952), Osvald’s clone 31 (1952), Osvald’s clone 72 (1952), Osvald’s clone 114 (1952), Sirem (1969), Zlatan (1976), Podlesak (1989) a Blsanka (1993). ZATECKY CHMEL is fine semi-early aroma hops grown in Zatec (Saaz) hop growing region, which is used by breweries in the whole of the world thanks to its unique characteristics. In the brewing industry especially during the production of high quality brand beers takes the ZATECKY CHMEL very important role. When using ZATECKY CHMEL a beer with delicate and soft hop aroma with a balanced and pleasant taste aroma can be produced. ZATECKY CHMEL is a guarantee of the highest quality. ZATECKY CHMEL is characteristic by delicate hop aroma, soft spindle, low content of Myrcen and balanced content of Alpha and Beta acids. The composition of hop resins is specific by relatively low content of Alpha-bitter acids in the range of 2, 5 up to 5,5 %. The content of Beta-bitter acids is higher than content of Alpha-bitter acids, their mutual share is in range of 0,60 - 0,80. The content of Myrcen is in the range of 25 - 40 %. Other typical feature is a high amount of Beta-farnesene (14 - 20 %) in content, which is in minimal amount in content in another hop. The overall character of aroma of ZATECKY CHMEL is set by mutual share of particular components of hop essential oil. ZATECKY CHMEL is grown in Zatec (Saaz) hop growing region. It is the cadastral area in district of Louny, Rakovnik, Chomutov, Kladno, Pilsen-north, and Rokycany. 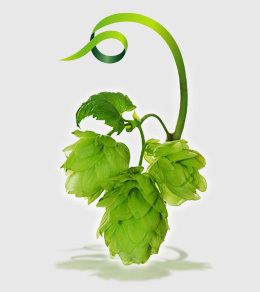 The cultivation of hop has had thousands years tradition in Zatec (Saaz) hop growing region. The Act about Hop Protection No. 97/1996 Co. further specifies particular cadastral districts. The centre of Zatec (Saaz) hop growing region and the seat of hop organizations and also the centre of hop processing is the town of Zatec. The basic for the uniqueness of ZATECKY CHMEL are the typical nature conditions in Zatec (Saaz) hop growing region. This area is from North-West protected by Ore Mountains, Doupov Mountains and Czech central mountains that create so-called rain shadow. Due to this rain shadow the annual total rainfall is only around 450 millimeters. The range of rainfall is favorable for hop development (during the vegetation period the average rainfalls are around 260 millimeters). The average annual temperature is from 8 to 9 °C (during the vegetation period temperature 14-16°C). Together with climatic conditions also the soil has good affect on quality of hop from this area. The soil here is especially Permian Red, but also lighter arenaceous marl soil. The position of hop-gardens, their altitude (from 200 to 500 meters above the sea), their position in terrain, their slope and exposition to north, west, south or east has also an influence on hop development and quality. There are especially wide open valleys with free flow of air, sufficiently protected against sharp west and north winds. According to these conditions the hop would not reach such a quality and harvest in other areas. The environment influences mainly substance content and height of plants. Above mentioned conditions (combination of average rainfall, temperatures, soil profiles, altitude and light) are unique for Zatec (Saaz) hop growing region and other hop areas in the rest of the world would be always different in some of these basic conditions. Hops in the Czech Republic is subjected to certification according to Act No. 97/1996 Co., about hop protection and also to Regulation of EU (Counsel Regulation 1952/2005, Committee Regulation 1860/2006). The institution accredited for certification of hops in Czech Republic is the Central Institute of Supervising and Testing in Agriculture (further only Institute). The certification of origin is guaranteed by process which is regulated by law. Hops is labeled, weighted, numbered and sealed according to cadastral district of origin and type of varieties. The Institute does verifying of labeled hop and hop products with a written verifying document (certificate of origin) and assures checks for fulfilling of responsibilities set by Act about hop protection and by Regulations of European Community.